Please note that dynamic aimpoint adjustments based on predictive thermal modeling were adopted beginning for Observing Cycle 18 (fall 2016). As a result, recommended pointing offsets will not change from year to year as they have in the past, as setting Yoffset, Zoffset, and SIM to zero will always put the source near (CHIPX,CHIPY)=210,520 on ACIS-S3. Observers, however, will still need to consider several options for subarrays and Yoffset depending on the specific goals of their observations. This page is intended to aid proposers and observers as they select instrumental parameters for LETG/ACIS-S observations, specifically with regard to pointing offsets and subarray configurations. Most of the information presented here is also in the Proposer's Observatory Guide (see especially Table 9.3 and section 9.4.2/Offset Pointing). The additional contributions of this page are specific subarray configurations and links to the Spectrum Visualization Tool. The default for the SIM Offset is now 0 (prior to 2016 it was -8 mm) in order to maximize effective area at energies below ~1 keV. With this SIM Offset value the spectrum will fall near the middle of the CCD array, around row CHIPY=520. Early in the mission there was very little contaminant on the UV/Ion Shield but ACIS gain and Charge Transfer Inefficiency were not as well calibrated as now. To minimize calibration uncertainties and their effect on order sorting, the spectrum was placed close to the readout, around row 180. Contamination has increased over time, and is thicker near the edges of the ACIS-S array than in the middle (row 512). X-ray transmission and effective area are therefore highest in the middle (see figures below). Over time, because of degradation in thermal insulation, it has become harder to maintain a constant temperature in the spacecraft structure and instruments, leading to larger pointing errors. This sometimes results in the spectrum falling on even lower rows, with significantly thicker contaminant and lower EA. Spatial gain variations and CTI are now well calibrated, permitting accurate order sorting across the entire array. Because of the changing thermal environment of the telescope, the aimpoint has drifted over time. For many years, observers wishing to make observations at the best focus had to specify small offsets in Y and/or Z pointing. This is no longer be necessary as aimpoint position modeling results are automatically incorporated into mission planning software. The default Z-offset is therefore 0. 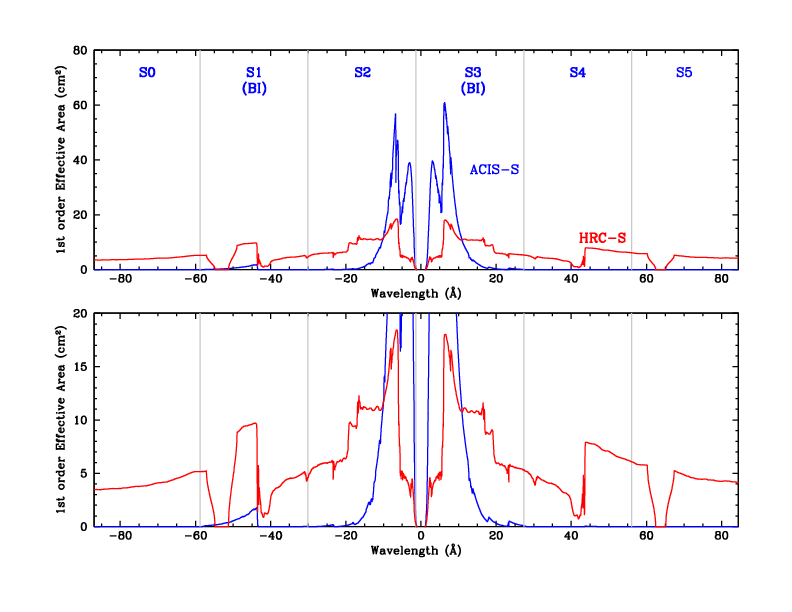 For many years, most LETG/ACIS-S observations used a Y-offset of roughly 1.5' in order to place the important He-like O lines and the O-K absorption edge on the S3 chip; as seen in the figure below, the Backside-Illuminated (BI) chips, S1 and S3, have much higher QE at low energies than the Front-Illuminated (FI) chips. Over the years, as the aimpoint drifted and aimpoint errors increased, the recommended Y-offset tended to decrease. To address these issues and simplify observation planning, the aimpoint was recently redefined so that Yoffset=0 always corresponds to chipx=210, and any aimpoint drift is accounted for during observation planning. A predictive thermal model has also been implemented (beginning Sep 2016) to reduce pointing errors. The current recommendation for most LETG/ACIS observations is Y-offset=1.2', which will place the major Oxygen features on S3 while ensuring that 0th order does not get too close to the S2/S3 gap. The following Y-offsets are of particular interest. 0.00' Use this offset to obtain the highest possible spectral resolution. +1.20' This is the offset recommended for most observations as it puts the major oxygen emission lines and absorption features (without redshift) safely on the S3 chip, well away from the lower-QE S4 chip. Spectral resolution is degraded by 15-20%. +1.34' This is the largest offset that can be used and still guarantee that 0th order remains on S3, providing the 3"+8"+11" margin noted above. +1.80' Assuming perfect pointing, this centers 0th order in the gap between S2 and S3; a small fraction of 0th order events will fall on each chip because of dither. There will be uninterrupted spectral coverage (apart from chip-edge dither effects around 28 Å) by the BI chips (S1 and S3) from 0 to 57 Å but users may need to manually determine the 0th order position and reprocess in order to obtain correct wavelengths. Spectral resolution is degraded by ~25%. Figure 1: LETGS 1st order effective area (EA) with ACIS-S and HRC-S; lower panel shows low-EA regions in more detail. The effects of dither and ACIS bad columns are included. Light grey lines mark ACIS chip boundaries, and HRC plate gaps appear near -53 and +63 Å. ACIS curve is for Y-offset=+1.2' and HRC curve is for Y-offset=0'. ACIS EA is from July 2018. Figure 2: Effective areas (from 2015) at different ACIS rows, normalized to row 180. Contaminant on the UV/Ion Shield is thinnest in the middle of the array, yielding higher X-ray transmission and EA. As of late 2015, it is recommended that observations use SIM Offset of 0 with Zoffset=0, which will place spectra near the array center where effective area is highest. Very few LETG/ACIS observations use the full ACIS-S array, which has 1024 rows and takes 3.2 seconds to read out. Using a subarray and/or fewer than 6 chips allows a faster readout (shorter frametime) and thus produces less pileup in 0th order and the dispersed spectrum. From Figure 1 one can see that S0 and S5 are useless for detecting 1st-order photons, although they may be useful for collecting higher order spectra in some cases. The S4 chip is also unlikely to be useful. Because of increasingly stringent ACIS thermal requirements, the S0 and S5 chips should be turned off unless there is a good reason for their use. Note that chips can be marked as "Optional", in which case they will be only be turned on if Mission Planning schedulers determine that thermal constraints will not be violated. The LETG/ACIS background is weak enough that observers often don't bother with background subtraction. In this case, a subarray as small as 128 rows can be used. If background subtraction is to be used, a subarray of at least 160 pixels is needed; 88 pixels for the default background regions which extend to 1.06 mm on either side of the spectrum, 32 pixels for dithering, and 40 pixels for Z pointing errors of up to ±10". Alternatively, users may reprocess their data by specifying narrower background regions in tg_extract. To summarize, 3 or 4 chips will suffice for most observers. A 128-row subarray should be OK but there will be little room for background regions. If you plan to use the standard background regions you should chose at least 160 rows, although custom background regions can be specified to use whatever area is available. The tables below list subarray parameters for the traditional 1/2, 1/4, and 1/8 subarrays, and for optimized subarrays that maximize the number of rows for a given frametime. SIM Offset=0 and Z-Offset=0 are assumed, with the spectrum centered in the cross-dispersion direction on row 520 (very near the center of the ACIS-S array). and rounding up to the nearest 0.1 sec.